During Palo Alto's formative years, the Club was the women's arm of local government and school affairs at a time when women were ineligible to vote or hold political offices. Uniting people and place, The Woman's Club of Palo Alto builds on a proud history of public engagement. The official name of the club is The Woman's Club of Palo Alto, not the Women's Club of Palo Alto. By using the original name, The Woman's Club of Palo Alto, we strive to honor our historic roots and express gratitude for the intense activism of our early members. During Palo Alto's formative years, the Club was the women's arm of local government and school affairs at a time when women were ineligible to vote or hold political offices. Uniting people and place, The Woman's Club of Palo Alto builds on a proud history of public engagement. Our members apply themselves in creative and philanthropic ways to accomplish great things both in the local community and within the club. Learn more about our philanthropy and community outreach. The Woman's Club of Palo Alto is a member of the General Federation of Women's Club as well as a member of the California Federation of Women's Club. In terms of membership, we are the largest club in the state of California. Woman's Club or Women's Club? 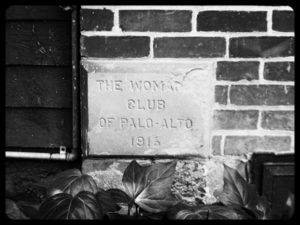 By using the original name, The Woman's Club of Palo Alto, we strive to honor our historic roots and express gratitude for the intense activism of our early members. The Woman’s Club of Palo Alto originated in the 19th Century during the Woman Suffrage movement and the Woman’s Christian Temperance Movement. Alice Park, an active club member, worked hard for women’s rights locally and abroad and Emily Pardee Karns Dixon, twice president of The Woman's Club of Palo Alto led the successful local drive for California women’s voting rights in 1911. 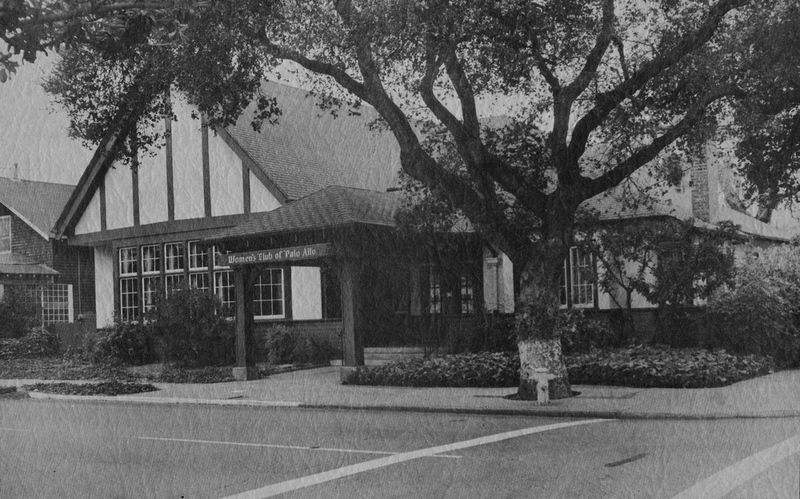 The Woman's Club of Palo Alto was founded by a group of women in the Stanford Mother's Club who organized a meeting in the old Presbyterian Church at the corner of Hamilton and Waverly and on June 20, 1894 they formally incorporated with 24 members. After a year of planning, a group of women in the Stanford Mother's Club organized a meeting in the old Presbyterian Church at the corner of Hamilton and Waverly, drafted a membership constitution and on June 20, 1894 they formally incorporated as The Woman’s Club of Palo Alto with 24 members. Mary Grafton Campbell was elected President and served in that office through 1898. The Woman's Club of Palo Alto have a long history of leadership in local public engagement. Within the first four years of the club's founding, Woman's Club members initiate many community initiatives which we all take for granted today. Civic activities included convincing Palo Alto City Hall to install sewers to prevent typhoid that had decimated other towns, founded the first elementary and high school in Palo Alto, funded and opened the first reading room, set up the first town gymnasium purchased, planted, watered and pruned street trees, recommended city park locations and landscaping and sponsored town clean-up days. Advocating for women. Driving Change. Woman's Club members initiated many community initiatives we often take for granted today. They convinced City Hall to install sewers to prevent typhoid that had decimated other towns. They purchased, planted, watered, pruned street trees. They opened the first Elementary and High Schools in Palo Alto. The Club's Village Improvement Committee recommended park locations and landscaping. They sponsored town clean-up days. They founded the Palo Alto library. In 1901, before Carnegie funds were granted, The Woman’s Club circulated a petition requesting a Public Library. The necessary number of signatures was acquired and the City was compelled, according to State Law, to provide a Public Library. Founding the library took countless hours of fund raising, holding Book Socials and applying for a grant to build the first town library. They rented a space, staffed it with Woman's Club volunteers, and donated the first books. Every year, schools were high on the Club agenda. The Club donated art for classrooms, petitioned for better pay for teachers, paid all the expenses of a gymnasium, and argued for free textbooks. To this day, the Club has a scholarship fund. At the request of teachers, the Club hosted Home and School meetings—the predecessor of the PTA. In 1909, the Club nominated for Board of School Trustees. Our member Mrs. C.L. Place was the first woman elected to any Palo Alto office. The Club responded then and now to crises. During the typhoid epidemic of 1903, they delivered food to the sick. In 1906, they helped San Francisco earthquake refugees. The Woman's Club provided hospitality to Camp Fremont soldiers and their families during World War I. In 1989, the Club sent money and supplies to Watsonville, hard-hit by the earthquake. Responding to the hurricane relief efforts in 2005, the Club engaged in fund raising to support needs in Mississippi and Louisiana. 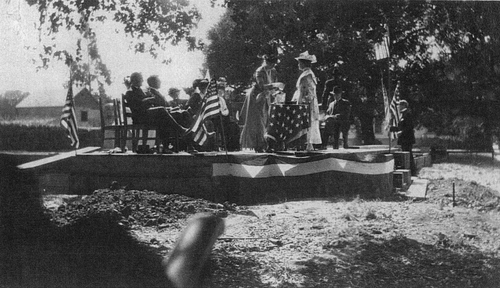 From 1909 to 1911 The Woman's Club of Palo Alto members, Alice Park and Emily Pardee Karns led the way in the successful Palo Alto campaign for women's suffrage. A ballot measure for women’s suffrage failed in California by a slim margin in 1896 (however, Palo Alto, in it inimitable way, had voted in favor). In 1909, the Woman’s Club nominated Mrs. Place to be a candidate for the School Board. Her victory primed them for the woman’s suffrage amendment which was again presented to California voters in 1911. The Woman's Club of Palo Alto provides members with a modern version of our club's original purpose - Friendship. Community Involvement. Self-Improvement. Members have many opportunities to invest in the town and region, participate in club activities, interesting programs, committees and many interest groups throughout the year. keep learning and exploring in the world. Don't know any current members, or just want more information? Applicants are invited to join in June for the upcoming year. Complete this form to inquire about membership. Interested in renting the Club for a private event? Visit our Rental Information page and complete our Rental INQUIRY form. Our venue is available to rent every day of the year!